Build stronger road pavement by adding PolyCom to the existing materials. PolyCom has a pronounced effect on the behaviour of the pavement such that maintenance is dramatically reduced which of course reduces life cycle costs. What is also remarkable about PolyCom is the simplicity of the whole process from delivery to application. PolyCom is supplied in 2kg bottles, which will stabilise 50m³ or 100 tonnes of material. Again, the application rate is made simple: it is the same for every material. PolyCom was developed this way. So if you are stabilising a 1km long road, 5m wide to a depth of 100mm, you only need 10 bottles, which can be delivered by car. How can so little go so far? Well, PolyCom is sophisticated in its design and development, but with simplicity of use in mind in every facet of its application. 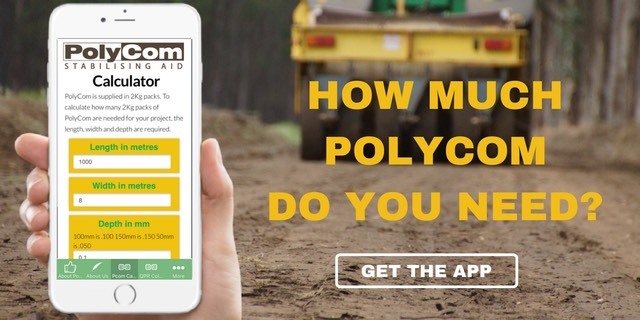 PolyCom is spread dry with purpose-built spreading units which are attached to the rear of a site vehicles (or can be handheld for small areas) and only takes a few minutes. It will not disrupt normal construction practices. PolyCom spreading is very simple and can be done by any person in the crew. Once spread, all you need is the usual road construction plant, ie grader, rollers and a water truck. PolyCom is then mixed through the material by simple blade mixing. For remote communities, this is a simple and inexpensive method of obtaining an enhanced unsealed pavement with greatly reduced maintenance and cost. Finally, perhaps the most simple aspect of PolyCom is that it will work with almost any existing road material so you don’t have to import any expensive gravel. Just use what you have and add PolyCom. Simple! Stabilisation and improvement to gravel and crushed rock. Improvements to in-situ ground normally cut to spoil: improving clays, silts, sands and variations of these can deliver useful and workable In-situ ground, saving time and money for the project. Road construction and upgrading of haul roads. Improvements to access roads and work areas.